Dr. Haroon Moosa is a Consultant Adult Psychiatrist with NHS and private practices in the Lancashire area. He qualified from the University of Manchester in 1994 and has been a member of the Royal Collage of Psychiatrists since 1998. He has been a Consultant Psychiatrist since 2002. Dr. Moosa treats all mental health conditions. He has a special interest in the assessment and treatment of depression, anxiety, bipolar disorder, post traumatic stress, obsessive compulsive disorder, psychosis, all forms of addictions and Adult ADHD. 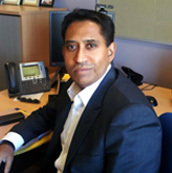 He has wide experience and knowledge in treating patients from the ethnic minority areas of Lancashire. He is able to communicate in various Asian languages including Urdu and Gujarati. He is involved in teaching medical students and psychiatric trainees. He is an examiner for the Royal College of Psychiatrists. Dr. Moosa has an active medico-legal practice and is regularly involved in writing psychiatric reports and giving expert evidence for both family, civil and criminal proceedings. More recently, Dr. Moosa has developed a growing interest in the assessment and treatment of patients suffering from Adult ADHD (attention deficit hyperactivity disorder).